You may not have noticed this when it happened, but North Carolina elected a Democratic governor in 2016. It was a close race, and Republicans demanded multiple recounts, but eventually they conceded and Roy Cooper was declared the winner. But that didn’t mean everything was over. After all, there was another month left in which lame duck Republican Pat McRory was still governor and the Republican legislature was still running things. So they did something unique: they passed a series of bills that stripped the governor of some of his powers. Cooper sued after he took office, of course, and the whole mess is currently working its way through the courts. Still, as corrupt as this was, at least it was just North Carolina, which has a recent history of anti-democratic actions barely matched since the end of Reconstruction. With Democrats set to take over top statewide offices next year, Michigan Republicans are considering proposals that would allow the Legislature to intervene in legal battles and shift oversight of the state’s campaign finance law to a new commission. The lame-duck power plays would limit the power of Gov.-elect Gretchen Whitmer, Attorney General Dana Nessel and Secretary of State Jocelyn Benson. Democrats have not held all three posts since 1990. Republican lawmakers in Wisconsin are making a last-ditch effort to strip crucial powers from the incoming Democratic governor and attorney general before Republican Gov. 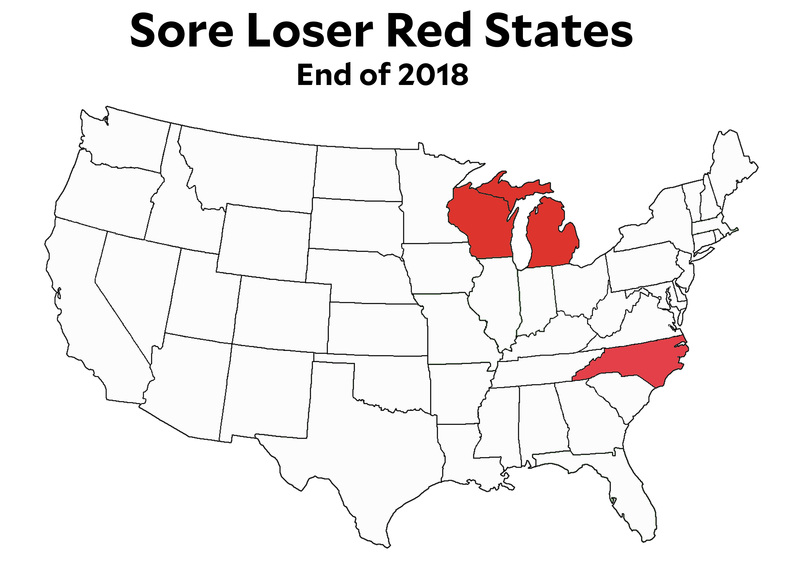 Scott Walker finishes his term, in a move that could have sweeping implications for health insurance and voting rights in one of the country’s most important swing states. In a special session on Monday, the Republican-held Legislature will consider a bill that would … take away his ability to approve major decisions by Attorney General-elect Josh Kaul … granting this power to Republican lawmakers instead. The 141-page bill was unveiled Friday, and lawmakers are expected to vote on it Tuesday. And so the red splotch expands, as Republicans desperately try to thwart democracy and the usual peaceful transfer of power. Will our courts let them get away with this? Stay tuned. UPDATE: Yes, I seem to have regressed to the point where I can no longer distinguish between Virginia and North Carolina on a map. 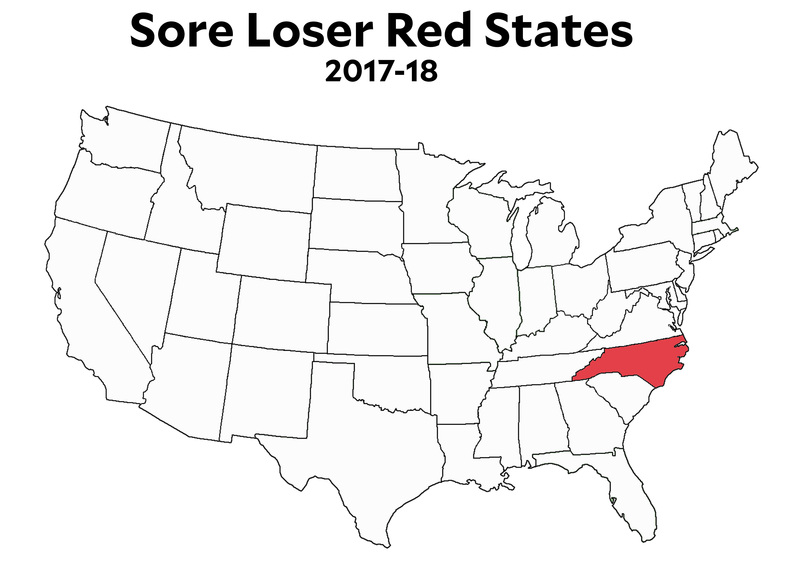 Sorry, Virginians! The maps have been corrected.